It was my penultimate day as a twenty-six year old, and two before my first anniversary as a member of 26. A good day to embark on 26 Pairs of Eyes. I cycled from the onefinestay office at Angel to Bloomsbury. It was the route I used to take each morning to lectures and seminars at UCL, though I’d never been to (nor heard of) the Foundling Museum, tucked away next to the College’s School of Pharmacy overlooking Brunswick Square Gardens. That only made what was in store all the more fascinating. We had the Museum to ourselves, and the privilege of a tour through the exhibitions. Some of the objects earmarked for the project were pointed out to us along the way. Of course, knowing that you’ll be paired with one before the afternoon is out, you begin a wish list: the portrait of Hogarth, Handel’s will, or Hogarth’s portrait of Captain Coram. I had eyes for the stars. So when my name eventually came out of the tricorn hat, paired with “A Flagship Under Easy Sail by Charles Brooking”, I couldn’t picture it. Luckily, it was immediately on my left. 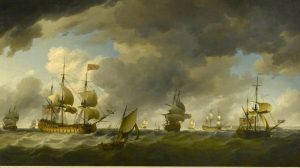 A huge seascape, one quarter white-crested waves, three quarters windswept sky, and a squadron of British naval vessels sailing between patches of sunshine. It felt right. Before moving to London to start university, I’d spent eight months on a traditionally maintained tallship – Soren Larsen – in the South Pacific. Let’s call it Sorendipity. And after seven years in the city, Brooking’s painting brought back all those memories of being at sea. Climbing rigging, hauling lines, scrubbing decks, sitting at the bow on watch, under the clearest night skies I’ve ever seen. The tremendous power of wood and canvas – 300 tons of it – propelled by the wind, carving a way through the waves. But the brief wasn’t going to be answered by indulgent reminiscing. The task was clear. My sestude needed to help visitors to the museum see Brooking’s painting in its full richness. I set about finding an angle. My starting point was the label that accompanies the painting. Brooking was discovered by the Foundling Hospital’s treasurer – Taylor White – who alongside Hogarth was instrumental in finding, commissioning and exhibiting artists (for what would be the first public art exhibition in Britain) at the Hospital in the 1740s and 50s. Taylor White had discovered the “notoriously shy” Brooking and commissioned the seascape in February of 1754. It had been completed in 18 days, in situ (Brooking’s garret being too small to contain the piece). It was also a companion piece to a painting in the collection by an older marine artist, Peter Monamy, since lost. I’d need to read up about that, especially if I was daring to write a new companion piece. The dates stuck out, too. Brooking died within five years of completing the painting for the Hospital. He was commissioned in February 1754. It went on display in June. There was a lot to work with here, but I wanted more detail. So I started reading. I read everything I could in the Museum’s materials. I found out the frame (original) was Hogarth’s design. Coram was of course “captain Coram” and had made his fortune as a shipwright. Nearly 40% of foundlings apprenticed in the mid 1700s joined the navy – this was the period that Britain’s navy gained ascendency, ruled the waves. And, as I discovered, “notoriously shy” didn’t even begin to describe Charles Brooking’s story. Taylor White, with his eye for art, had struggled to discover the name of an artist (Brooking) who’d painted remarkable marine scenes he saw in a shop window, not because Brooking was shy, but because his “mark was constantly obliterated” by the picture dealer who stood to earn more from being middle man. In fact, other sources said that Brooking was “kept in a state of wretched obscurity” by art dealers, meaning that he never got credit (fame nor financial) for his work. That artist’s garret of my imagination became less Romantic, more rundown. Taylor White persevered though, and one day, walking past the shop on Castle Street, Leceister Square, saw a new painting by the artist. The shopkeeper away, he bought it from the wife. And this one had the signature intact. A lead! I needed to confirm the facts. I tracked down and read the only extant catalogue raisonné, by David Joel, with a short biography that corroborated the story. Brooking was truly plucked out of obscurity – perhaps destitution – by Taylor White. And the commission for the Foundling Hospital, a piece that would considerably dwarf Monamy’s seascape (and older, legitimately famous British artist), established Brooking’s claim as Britain’s next great marine painter. In fact, Joel says, Brooking defined the national style, elevating and divorcing it from Dutch influences (or “Dutch infection” in Hogarth’s day), and would probably have become the greatest ever British marine painter. Had he lived. Within five years of completing his largest work, Brooking died of consumption, “through injudicious medicine given for a perpetual headache”. The clouds in his seascape became more gloomy, the shadows and sunshine bittersweet. He was found, then foundered. Here was the story. Yet despite the real human triumph and tragedy, it all felt very academic, gleaned from historical sources. I needed something real – the object itself – to draw it all together. I decided I needed to spend some more time at the Museum. How I’ll miss darting off to Bloomsbury for an hour at lunchtimes. The discovery came on the second visit after I’d confirmed the signature story. I was sitting opposite the painting. I was looking around the room at these beneficent gestures. Given to the Hospital by Hogarth, Reynolds, Gainsborough etc. There was Brooking’s inscription, on the cartouche: Painted and given to the Hospital by Brooking, 1754. But, come to think of it, David Joel had meticulously confirmed each painting by the Brooking’s mark. So where was his signature?! I’ll confess, I had to use the torch on my iPhone to find it the first time. Writers’ tools, eh? But you can just make it out with the naked eye. If you know where to look. And if you didn’t, all you’d need was a little nudge – a clue or two. Charles Brooking pinx. Painted by Charles Brooking. The mark that saved a painter – continues to save him – from obscurity. Till Taylor White discovered his name. Haul the clewline – two, six – heave!